With Matt Cutts’ tweet, “Google is rolling out our Panda 4.0 update starting today” sent out on May 21, 2014, the entire Internet marketing industry was thrown into a tizzy. No one knew what to expect. Major marketing moguls found themselves in no man’s land not knowing how the update would affect their individual website rankings. As an explanation, Cutts stated that the update is designed to throw off low-quality content. When Google updates its algorithms, winners as well as losers are bound to come out. This has happened in the past and results of the recent update are no different. However, the biggest shock has come in the form of eBay, which was listed along with companies that were affected adversely. Searchmetrics provided the list comprising the names of winners and losers, where eBay appeared in the latter category. The international enterprise SEO platform for search engine optimization tools, which keeps a check of website rankings, mentioned that eBay’s ranking had dropped from 6th to 25th. eBay holds great reputation among online shoppers. Even as industry experts are trying to figure out other possible reasons for this performance, poor content is one of the evident answers. Winners, on the other hand, include the likes of glassdoor.com, a job portal, medtimes.com, and emedicinehealth.com, who have maintained top-quality content. • One of the major reasons for eBay’s ranking getting adversely affected its asleep-at-the-switch AdWords management style. It not only made the website appear dim to searchers, but the irrelevant ads cost them a lot of money, too. • If you critically notice, eBay’s landing pages for search results are thin. Visitors would rarely find detailed content on the page they landed, making it difficult for them to find the ideal product. 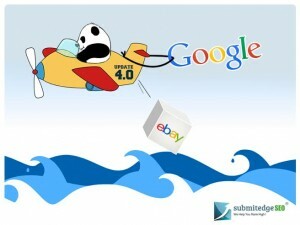 Google’s entire algorithm is focused towards quality content, lacking which affected eBay majorly. What Does the Future Hold for eBay? The decline in ranking has hurt eBay badly. However, since it contains hundreds and thousands of pages, it is quite hard to tell what the future holds for the Internet consumer-to-consumer corporation. Nevertheless, its popularity is bound to see decline for a limited duration, during which eBay’s traffic and sales would be affected significantly. Can Other Websites Be Affected by the Update? If you are a website owner, you might wonder whether the recent Google Panda update affected your website or not. Well, there is no one way of answering this, as a website can get affected due to several reasons. The best way to learn if the update has hurt your website is by looking at the search-driven traffic from Google. Do not focus too much on particular rankings or lists that have popularized after Google updates. If your website has experienced a significant increase, it has been rewarded; on the other hand, a big decrease means that your website is hurt. Since Google has begun to notify Internet users about the updates beforehand, you can prepare accordingly to prevent your website from enduring the brunt of the search engine’s algorithms. • Keep astray of blackhat SEO methods, as they only lead to the downfall of a website.